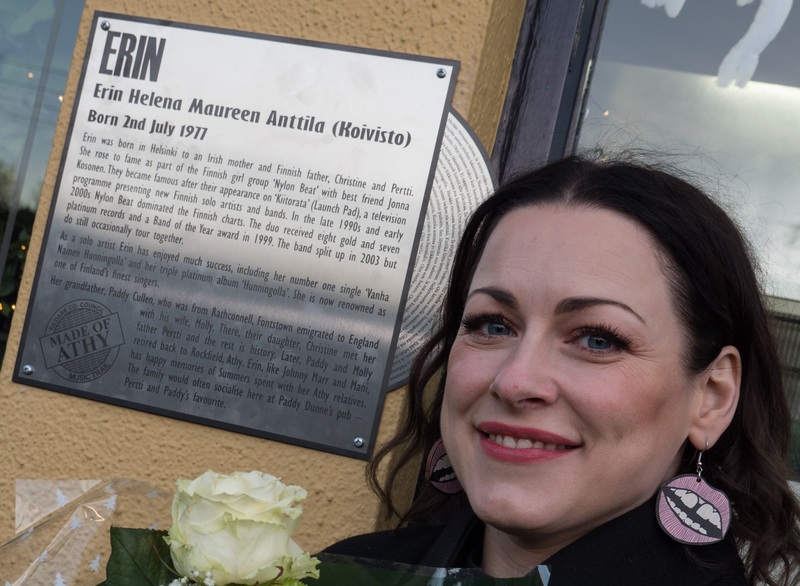 Finnish pop star, Erin, is the latest recipient of a Made of Athy commemorative plaque and yesterday unveiled a plaque to her outside Paddy Dunne's pub. Erin Helena Maureen Antilla (nee Koivisto) admitted that the occasion was an emotional one for her. She is the daughter of Christine, who was the daughter of Paddy and Molly Cullen of Rathconnell, Fontstown who emigrated to London where Christine met Erin’s father, Pertti Koivisto, a Finn who had also emigrated to London. Erin formed successful duo ‘Nylon Beat’ with her best friend Jonna Kosonen and dominated the Finnish charts in the late 1990s and early 2000s before going on to have a successful solo career. Finnish singer Erin Anttila (Koivisto), pictured with Cllrs. Martin Miley and Aoife Breslin and the Transition Year Students of Athy Community College. Anne Mutanen, Deputy Head of Mission at the Finnish Embassy, was in Athy yesterday to mark the occasion and told the crowd, including numerous students from Athy Community College that she remembered Nylon Beat as a teenager and how Erin has established herself as a successful solo artist in Finland. 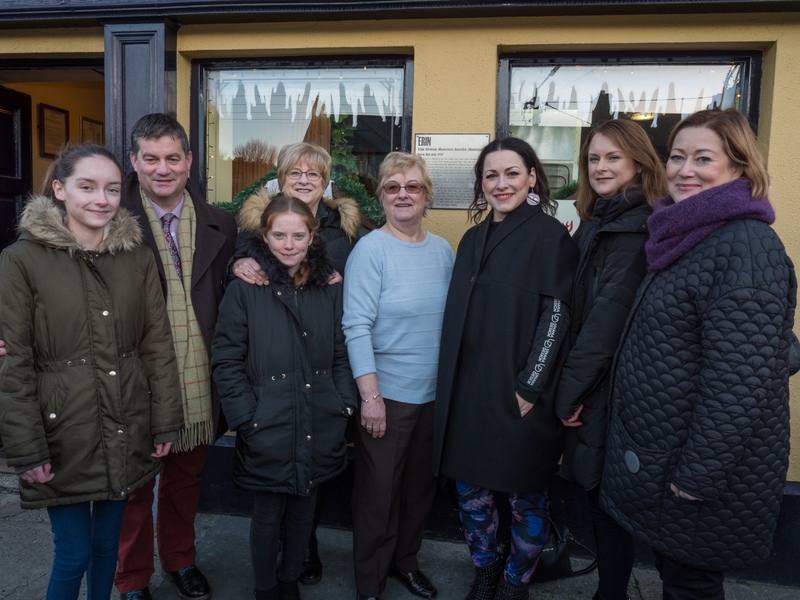 Finnish singer Erin Anttila (Koivisto) (third from the right) with family members, (from left) Amy O’Brien, William Cullen, Maureen Size, Ciara O’Brien, Erin’s mum Christine, Andrea Size, and Erin’s sister Ilona. Erin, and the plaque outside Paddy Dunne's on Woodstock Street, Athy.